The Companion App can be used on Android and iOS and Windows Phone devices! With the app, and the Nomad missions, you can unlock various rewards in the main game! (Prerequisite: Creating a U-play account / connection game and app). - In addition, (only app) you have access to the Nomad Brotherhood, recruit the Assassin and can you develop it and then send to so-called Nomad missions. - This Nomad missions must first be enabled in glyph puzzles for successful mission statements there again Nomad points. - In the main game you can collect anywhere so-called Nomad points, these are the currency that can be spent in the app. Nomad points can be earned (in the game) and by the renovation of Café Society clubs; Renovate social club "Cafe du Louvre"). - The renovation but also brings advantages in the game: Each acquired (renovated cafe) generates income Cafe le Theatre / In addition, the social club then serves as a quick travel destination / social club missions are unlocked and revolutionary songs. With the game patch 5, some errors in the game have been corrected or at least improved! - The most important adaptation: The exclusive contents of the Companion app, so the "Nomad chests" and "Initiates chests", are accessible without actions in the app, ie they can be open in the game. -The frequent synchronization problems of app and game have improved. - Example: In the game there are several Master Assassin uniforms, many can be found in the main or side missions, often in golden Initiates chests - but as the "Altair Master Assassin outfit" could only be found through the establishment of a Assassin Brotherhood , - Now all players have access to the chests, even without app! Glyphs Rästsel - serve to earn "Nomad points"; the ingame currency of the Companion app and the only way you can the available "Nomad" missions to unlock the "Nomad Brotherhood" (only app)! - Call in your app the overview map of Paris and searche for the exclamation tile - Glyph Puzzles / "Sainte Chapelle". Selecting! - You have to discover glyphs on the cathedral with the aid of a scanning pulse and touch. - Note: The first Glyph puzzle is easier, the number of scan pulses is unlimited. In the second glyph puzzles - 6 pulses are available. - Tips: You only have 6 scan pulses if you discover anything - 1 scan is consumed - BUT if you detects a glyph - you used is negligible additional scan pulse (ie, no scan waste) .- In addition, you really little time during the scan pulse, so the church positioned so that you have as much land in sight! - However, the app also allows impulses to buy, if you need more! - Reward:For every puzzle solved, a set enabled Nomad missions and there are additional Nomad points! The Nomad Brotherhood you can (bottom left) in the menu bar (only after the first glyph puzzle has been solved)! - Your Assassin recruit can be improved individually if you have collected in a mission experience points and have risen in the Level - then appear a golden symbol in the menu bar of the Brotherhood. This level points can be distributed to different attributes. - It offers itself with the deepening of certain attributes - specialist train / for the appropriate type of mission. For example. Defense and attack protector for missions. --- This increases the chances of success. - New recruits places in the Brotherhood - can be unlocked only by synchronizing vantage points in the main game! - Has an Assassin reaches its maximum level degree, he gathers no further experience points. Once the first glyph puzzle is solved, a set-Nomad missions unlocked. Only when you have completed the first Glyph puzzle, you can access the Nomad Brotherhood and Assassin allocate for the first time. - The game facilitates the selection of appropriate assassin recruits all have different abilities and in the allocation of the Assassin Recruits you see the prospects of success in percent, for the particular failure Sion. Then assign the "plus sign" and you're done! - At the start of the mission you just have to wait until the clock runs down, the more missions the longer the process. In mission 3, there were already up to 20 minutes of waiting. (So you can watch the mission on the phone just to run). - Each mission has certain mission rewards for the main game and experience points for participating recruits (for all) - If it fails, of course not! - You can run as many missions at the same time, the limit here is only the number of your assassins and their skill level! - So it obviously takes some time to Assassins have better values and achieve 100% completion of the mission alone or in pairs, and the mission can be accomplished in this way efficiently with limited staff. (Assassins can of course also against "real money" on the app to buy!). The investment for expensive Assassins can be worthwhile, then, so you should up and make a few easy to Nomad points! - For these missions you get in the main game - Rewards (chests) and artefacts or companion missions shown! - The APP: You will receive the refurbished social clubs (in game remodel !!) after a certain time – credited - Nomad points for completing individual orders. - Do not forget to collect these (golden Nomad-point symbol). 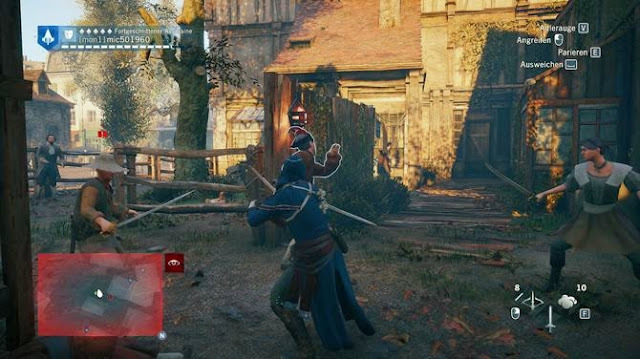 - Rewards and artifacts can be collected by Arno in the main game and also by Assassins from the Nomad Brotherhood. - Missions can be played three times, so our reward table also includes three rewards for each failure Sion, there are NOT three at a time, three special Different for each pass!